I grew up in Gravesend, where Pocahontas died and was buried in 1617. I’d always thought she was the first Native American to come to England, but when we moved to Bideford in 2001 I was intrigued to discover that ‘Raleigh’ had preceded Pocahontas by some years. It was when my oldest son went to his first Carol Concert with his primary school that I noticed the small picture frame in the porch of St Mary’s church. “In 1586 when Sir Richard Grenville returned from the newly established colony at Roanoke Island (North Carolina) he brought back an Alonquin Indian to this country and named him ‘Raleigh’ after his good friend and cousin Sir Walter Raleigh. 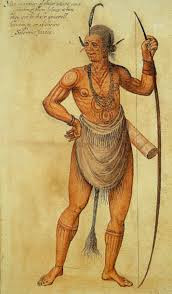 The Bideford Parish Register shows that on 27th March 1588 ‘Raleigh, a Wynganditoian’ was baptized into the Christian faith – the first Native American to do so. Wynganditoa was the name of the island (now called Roanoke) in the native Alonquin language. A tragic story, I think. It’s not clear whether Raleigh came willingly or was captured. Certainly he can’t have begun to imagine what he was coming to when he boarded that ship to England. Grenville, having named him as he might name a pet dog, intended to make use of him as a translator on his next expedition to North Carolina. Sadly Raleigh didn’t live long enough to go home. And as for the 115 settlers on Roanoke – their tale is probably no less tragic. The Spanish Armada and the subsequent war with Spain disrupted all sea traffic. By the time ships returned to North Carolina in 1590 the settlement had been dismantled. No trace of the settlers was ever found. I've never heard this story, must check it out. Thank you for sharing. How poignant! Illustrates the use of people as commodities, maybe, or maybe 'Raleigh' was really keen to travel and see our strange continent. I wish he'd lived to go home, though. I'd have liked to think of him sitting down and telling his stories, and the others maybe shaking their heads over these incredible yarns..